Traveling always comes with risks. Aside from the risks you may encounter along the way, there are the worries of what you left behind. Will the house burn down? Will the mail pile up, signalling to thieves that the home is empty? Will the server stay up? On a more prosaic note ... Will the plants in the garden all die from lack of water? Shortly before traveling to Oregon for OSCON, I acquired a cute little Cape Gooseberry seedling (courtesy of Mark Terranova at the south bay Geeknic). That's a new plant to me -- I'd never seen one before. But it was a cute little thing, and seemed to be flourishing. I had it in a pot on a little shelf where it would get morning sun but wouldn't get too hot in the afternoon, and was looking forward to planting it when it got big enough to withstand our marauding local seedling-loving snails. To get it through my planned week-and-a-half absence, I had one of those glass watering bulbs they sell in drugstores. They're supposed to last several weeks, though they don't work that reliably in practice. Still, I saturated the soil with water the morning I left, then filled the bulb and crossed my fingers for no long heat waves. I wasn't prepared for what I saw when I got back. Something had dug out my little gooseberry and taken it! I still have no idea what got it. We certainly have some local squirrels who love to dig, and young squirrels (still learning their digging skills) love potted plants. But I wouldn't think a squirrel would have much use for a gooseberry seedling -- they just like the act of digging. I wonder if cape gooseberry leaves are particularly tasty to rodents? 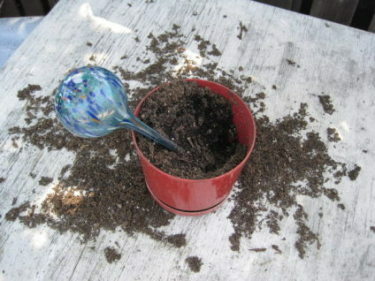 Ironically, the soil was still quite damp. The little plant probably would have made it through just fine.